A narrative focusing on the day to day interactions of a young protagonist, Arinzé Kene and tiata fahodzi’s production of good dog highlights a voice often ignored within the wider world. In light of stereotypical and harmful narratives constantly portrayed within the media, this immediate production brings to the fore the realities of a young black male, brought up in multicultural London yet faced with everyday injustices. Making its debut in 2017, critically acclaimed good dog returns for a national tour. 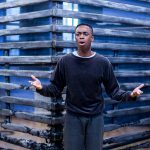 Ahead of the first show at Watford Palace Theatre, actor Kwaku Mills talks to us about taking on the ‘distinctively lyrical’ monologue, the show’s topical themes and what audiences can expect from the show.